The Global Volcanism Program has no activity reports for Moyuta. The Global Volcanism Program has no Weekly Reports available for Moyuta. The Global Volcanism Program has no Bulletin Reports available for Moyuta. Moyuta is the easternmost of a chain of large stratovolcanoes extending along the volcanic front of Guatemala. 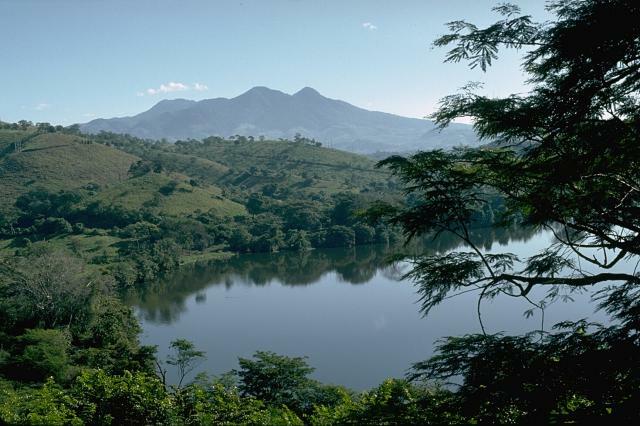 Like Tecuamburro volcano, it is offset about 20 km S of the main volcanic chain and lies south of the Jalpatagua Fault, overlying the southern boundary of the Jalpatagua Graben. The volcano is capped by a cluster of at least three forested, steep-sided, coalescing andesitic lava domes that from some distant perspectives give the summit a flat-topped appearance. Numerous cinder cones in various stages of erosion are located on the flanks of the complex. The age of the latest eruption is not known, although the summit domes were considered to have been emplaced in relatively recent times (Williams et al., 1964). Small fumaroles are found on the N and S flanks, and hot springs are located near Azulco at the NE base and along rivers on the SE side. Goff F, Janik C J, Fahlquist L S, Adams A, Roldan A, Revolorio M, Trujillo P E, Counce D, 1991. A reevaluation of the Moyuta geothermal system, southern Guatemala. Bull Geotherm Resour Council, 20: 290-298. The Global Volcanism Program is not aware of any Holocene eruptions from Moyuta. If this volcano has had large eruptions (VEI >= 4) prior to 10,000 years ago, information might be found on the Moyuta page in the LaMEVE (Large Magnitude Explosive Volcanic Eruptions) database, a part of the Volcano Global Risk Identification and Analysis Project (VOGRIPA). There is no Deformation History data available for Moyuta. There is no Emissions History data available for Moyuta. Moyuta volcano, seen here on the left-center horizon from the NW, is the easternmost of a chain of large stratovolcanoes extending across Guatemala. Its flat-topped summit is formed by a cluster of lava domes. Lava flows from the volcano interfinger with lacustrine deposits in the Jalpatagua valley, partly covered by the cloud bank below the volcano. 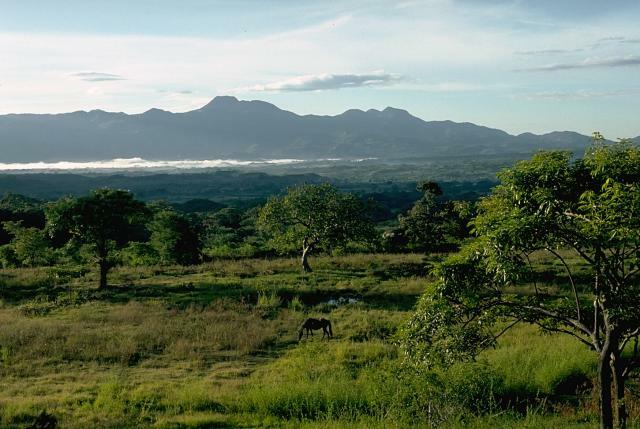 The volcano lies south of the NW-SE-trending Jalpatagua Fault and overtops the southern margin of the Jalpatagua Graben, which lies on trend with the medial graben of El Salvador. This view from the south shows a forested lava dome, one of a cluster of at least three steep-sided, coalescing andesitic-to-dacitic domes forming the summit of Moyuta volcano. The age of the domes is not known, but they are considered to be relatively recent features. The town of Moyuta, the outskirts of which are seen in the center of the photo, was constructed high on the volcano immediately adjacent to the summit dome complex. 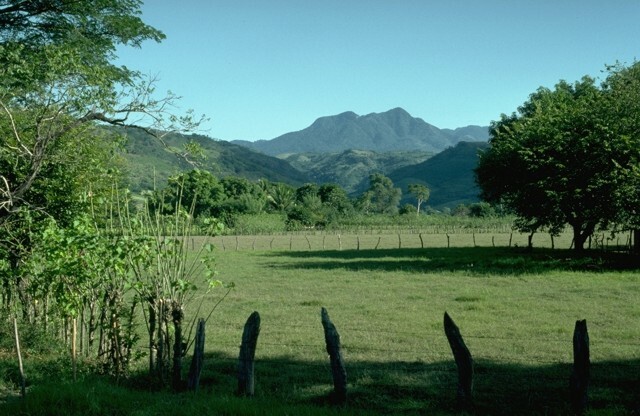 Moyuta volcano rises above farmlands on the Pacific coastal plain of Guatemala. The densely forested volcano is extensively dissected and is mostly of Pliocene and Pleistocene age, but has a cluster of relatively youthful andesitic-to-dacitic lava domes at its summit. North-trending faults cut the summit area and form step-like ridges. Fumaroles, acid springs, and bicarbonate-rich hot springs are located on the northern and southern flanks of the volcano. 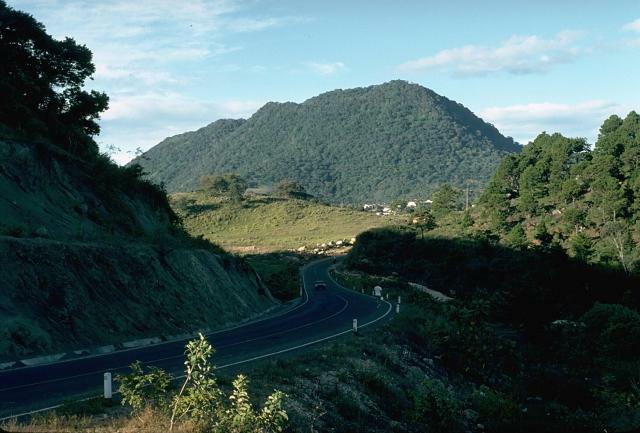 Moyuta is the easternmost of a chain of large stratovolcanoes extending along the volcanic front of Guatemala. The summit of the 1662-m-high volcano contains a cluster of forested lava domes. It is viewed here from a small lake to its SW at the edge of the Pacific coastal plain. The age of the latest eruption of Moyuta volcano is not known. 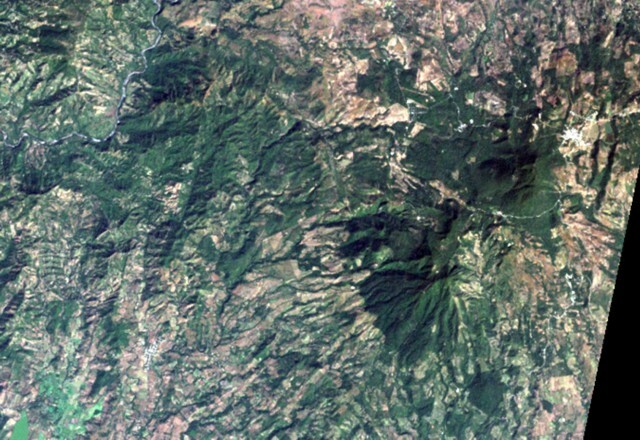 The large forested area at the middle right is the 1662-m-high Moyuta volcanic complex, its summit composed of a series of overlapping andesitic lava domes. The small white-colored area above and to the right of the dome complex is the city of Moyuta, which lies at an altitude of nearly 1300 m. Moyuta is the easternmost of the chain of large stratovolcanoes stretching across the Guatemalan Highlands. There are no samples for Moyuta in the Smithsonian's NMNH Department of Mineral Sciences Rock and Ore collection. Large Eruptions of Moyuta Information about large Quaternary eruptions (VEI >= 4) is cataloged in the Large Magnitude Explosive Volcanic Eruptions (LaMEVE) database of the Volcano Global Risk Identification and Analysis Project (VOGRIPA).